Guys, I'm in the mood of reading *clap clap. 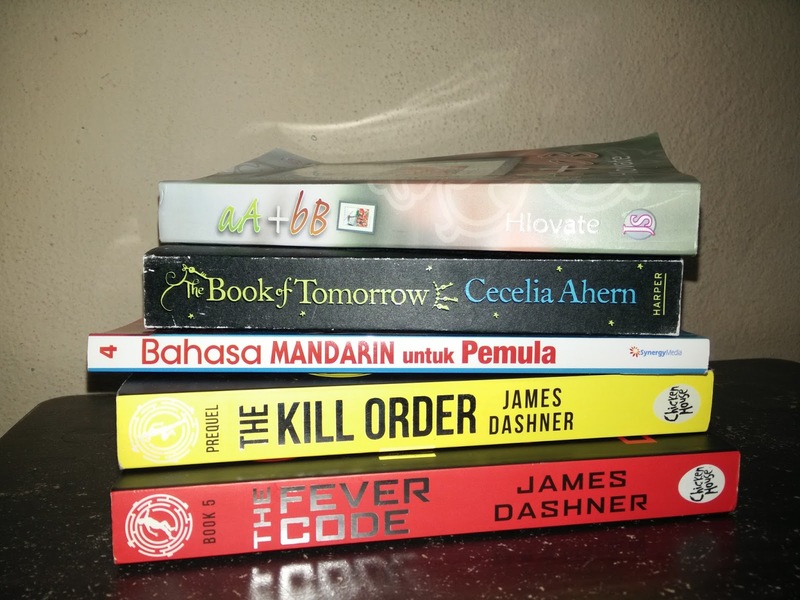 I actually have tonnes of books I'm yet to read back in my hometown but currently, I just have these five books here in Kulim. I did mention HERE in my older post, that I wish to learn Chinese and finally I bought 'Bahasa Mandarin untuk Pemula' for a stepping stone. But reading the book, I do have a problem; HOW TF SHOULD I PRONOUNCE THESE WORDS?! For example; wo xiang xuexi hanyu. Terbelit lidah k. By the way, it means 'I want to learn Mandarin'. The Maze Runner is my favourite series. I have bought all the books in the series a long time ago and I've read the trilogy, but I'm yet to finish these two. They're the prequel to the trilogy, that's why I'm procrastinating in reading them because there's no Newt nor Minho (as far as I've read them lah). 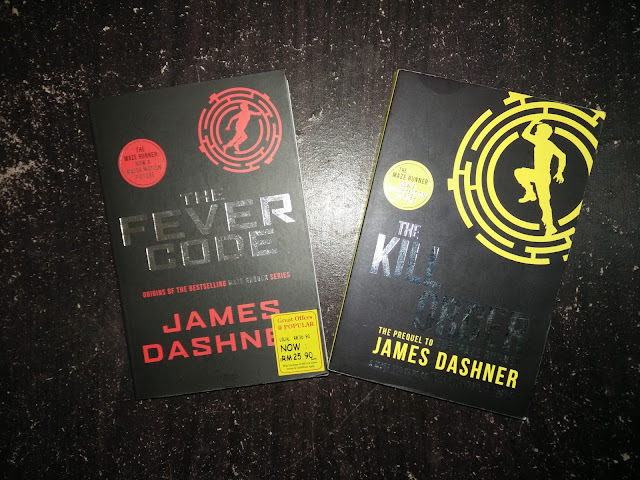 I'm currently reading 'The Kill Order', hoping to quickly finish it and start reading 'The Fever Code' as soon as possible. I just bought these two books about a few days back. I don't know if it's just me but I think most of us so called writers, dream to publish a book. 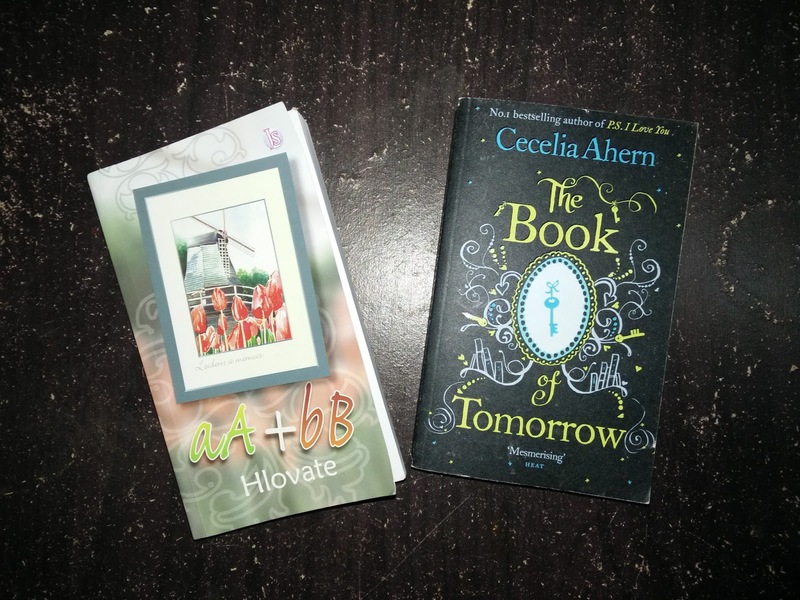 I bought 'aA+bB' by Hlovate because I'm planning to write a Malay novel manuscript. I've read a lot of good Malay novels especially from Aisya Sofea and Ahadiat Akashah but I never read Hlovate yet. It's been ages since I last read Malay novel so I thought to read Hlovate's for my manuscript reference since Hlovate is so popular among Malay novel lovers. I'm currently reading it but unfortunately, it is not up to my liking because the sentences are too simple and it made the cliche storyline uninterested. I would prefer the ayat-berbunga-jiwang-karat type of writing. But I would continue reading it nonetheless and maybe would buy Aisya Sofea's soon. Romance lovers wouldn't dare to deny Cecelia Ahern's books. Of course, 'Love, Rosie' was what made me fell in love with her writing. I was contemplating between 'The Book of Tomorrow' and 'The Time of My Life', I was thinking to buy both but since I have tonnes of books waiting to be read, I decided to buy just one and it is 'The Book of Tomorrow'. The synopsis was what attracted me to buy this book and hey, isn't the cover is the cutest? Tamara Goodwin hs had everything given to her. She has never wasted a thought on tomorrow. But when tragedy turns her world upside down, she has to leave her comfortable life behind, abandoning an affluent existence for the charity of relatives deep in the countryside. Fun fact; I love collecting books, especially novels but I'm too lazy to read them. So here's a challenge from me, to myself; I should finish reading all five books before ending May because I was thinking to buy a new one next month teehee. Do you have books you're yet to read? Novel Hlovate memang susah gila nak jumpa, I just found it dekat bookstore near my house. Entah lah kan, tapi Lya kurang gemar ayat simple sangat for a novel hee. Lain orang lain citarasa. But can't deny, Hlovate memang popular. Nak beli Flawed tapi belum jumpa bukunya! Sep sikit part fun fact tu hehe. Memang jenis suka perabis duit untuk buku tapi berkurun lama baru nak baca. Lya pernah try baca E-book, turns out, I'm not a fan haha. I love Hlovate's work, probably because the content ._. I used to love reading malay novel with berbunga punya ayat tapi lepas start baca HLOVATE's I just stop I guess? Hiks. Dan rasanya, Jemari Seni kebanyakannya memang struktur ayat stail sama - closed to our daily conversation, mudah faham. Alaf 21 berbunga ._. Thanks for the suggestion! I never read english yang berbunga lagi, definitely will try to read it. Yeap berbelit lidah nak sebut kan ! I just read Flawed from Ahern and it was superb. I want to try the other too but im afraid its gonna have so much lovey dovey & tears thingy. Haha. I've read only one Hlovate novel entitled Contengan Jalanan. It was more to jalan mencari tuhan and one of the best contemporary books I ever read. Im not yeat start reading kill order and the fever code tho i only have bought the kill order first. Haha. I hate to be left without answers. Lols. Sounds intriguing enough to me. I'll definitely find and read Flawed then! Might as well try to read Contengan Jalanan then if you said it's good. I believe in youu. I hate it too haha and that answered why I've been procrastinating in finishing the two books. I don't remember when is the last time i read malay novel yg berbunga bunga (except for 7 hari mencintaiku, this was different haha), but novel from aisya sofea's are my fav! Aisya sofea and ahadiat akasyah are my fav malay novel writers.